So, the 12th and latest One Piece movie, One Piece Film: Z came out this past weekend. 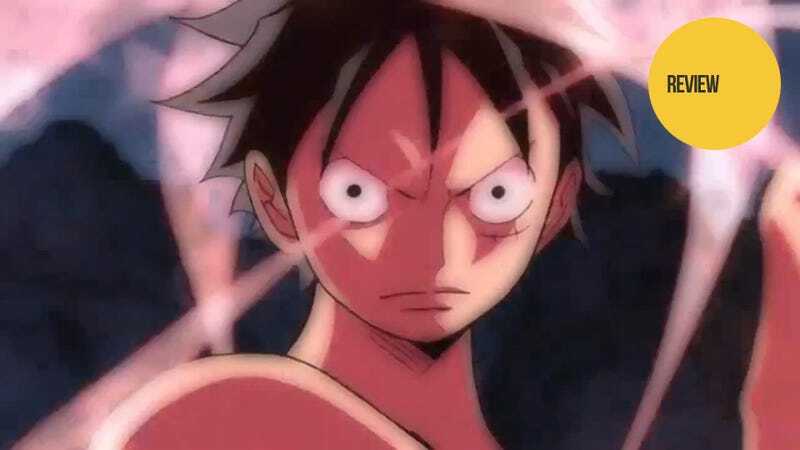 The movie made over 750 million yen on its first day, proving once again the extreme popularity of the One Piece series. Even so, numbers can be deceiving and even terrible movies can pull in millions of viewers if they're marketed right. I went to the theater with a pretty skeptical mind; I'd been somewhat burned with the one of previous movies, One Piece Film: Strong World. I was skeptical, but at the same time, I hoped that the movie would be good. Something that was, at the very least, not a pile of dung. What I got was something I totally was not expecting. The story revolves around a former navy admiral who calls himself "Z" (pronounced "Zed") and his plot to rid the world of pirates and what happens when Luffy and crew cross his path. The character of Z is, simply put, a sympathetic villain. This is a trope often used in stories, but rarely so successfully. The movie begins by showing you what Z has become, and then spends pretty much the entirety of the movie showing you how he became that way. The backstory of Z is both dramatic and, more importantly, convincing. So much so that while you may not agree with his goals, you totally buy into it. The character is so well portrayed, that almost every other character, even the main cast, pales in comparison. The movie does a superb job of never overdoing things. Action sequences explode on the screen and then wrap up and you're given a moment of humor and/or drama before moving on to the next moment of action or tension. Hints of the tragedy of Z are sprinkled throughout the film in such a manner that by the time you get the story of what actually happened to him, your expectations have been built up to a point where the reveal totally pays off. The movie isn't without its traditional hiccups that are often seen in anime movies, but they generally don't overplay things and the general progression of the story feels much more organic. Obviously, Z is not the only character. The movie has its array of secondary characters, albeit a much smaller collection than previous films, who take part in the story. Some as enemies, some as allies, some as neutral observers. This ends up being a bit of a mixed bag on the whole. Some of the characters have their own plot lines that connect nicely with the original story. However, most of the characters wind up as foils to build on the character of Z. Even Z's own followers end up completely underdeveloped as a result. By the climax of the movie, you, the viewer, feel heavily invested in the story. The stakes are high and the conflict involved is one where no one will be walking away unscathed. But when the dust settles, and you sit back and contemplate what you've seen, a lot of things remain unresolved. Character arcs and other plot points are either forcibly cleaned up or remain dangling here and there. It feels a bit like they focused so much on developing the character of Z, that everything else ended up being secondary. Overall, One Piece Film: Z was immensely satisfying. It wasn't a prefect movie, but as Shonen Jump anime films go, it was the best one I've ever seen. While most other movies have a tendency to buckle under the limitations of being a stand-alone movie, (i.e. they have to end exactly how they started) Z seemed to make the most such limitations and genuinely feels like it is part of the main series. Personally, I feel what they had was good enough that they could have taken what was a single dense stand-alone movie and made it into a two-part masterpiece to further develop other characters and satisfying tie everything up. Personal ideas aside, the movie is definitely well worth seeing for any fan of the series. One Piece Film: Z is currently in theaters in Japan.